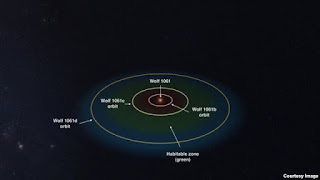 This is a simulation of the orbital configuration of the Wolf 1061 system. Wolf 1061 is an inactive red dwarf star, smaller and cooler than our sun, 14 light years away. Australian astronomers say they've found the closest potentially habitable planet to Earth outside the solar system. And it's only 14 light years away! The researchers from the University of New South Wales say planet Wolf 1061c is believed to be four times the mass of Earth. It is one of three planets that were discovered around a red dwarf star known as Wolf 1061. "It is a particularly exciting find because all three planets are of low enough mass to be potentially rocky and have a solid surface, and the middle planet, Wolf 1061c, sits within the 'Goldilocks' zone where it might be possible for liquid water -- and maybe even life -- to exist," said lead author Duncan Wright of UNSW. "It is fascinating to look out at the vastness of space and think a star so very close to us -- a near neighbor -- could host a habitable planet,” he said. Other planets have been found closer to Earth, but they are not “remotely habitable” said Wright. 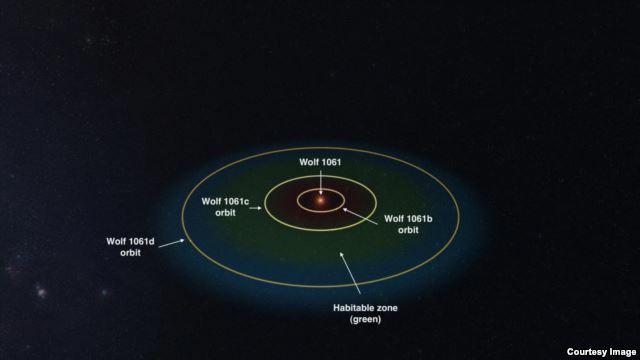 The researchers said in a news release the three newly detected planets orbit the relatively cool and stable star Wolf 1061 every five, 18 and 67 days. Small, rocky planets are believed to be common in our galaxy, but most of the exoplanets discovered so far are hundreds or thousands of light years away. One exception, researchers note, is Gliese 667Cc, which is 22 light years away from Earth. It, too, orbits a red dwarf star, but does so every 28 days and is more than four times Earth's mass. "The close proximity of the planets around Wolf 1061 means there is a good chance these planets may pass across the face of the star. If they do, then it may be possible to study the atmospheres of these planets in future to see whether they would be conducive to life," said team member Rob Wittenmyer. The discovery will be published in a future edition of Astrophysical Journal Letters.